Prophecy has had a built-in statistical forecasting engine from day 1, providing core time-series modelling without the need for statistical knowledge. The core engine contains the standard, most widely used time series forecasting algorithms. Learn more on the core statistical forecasting engine here. Prophecy offers an 'Automatic' mode, requiring minimal statistics or R knowledge, and an 'R Expert' mode for 'to the metal' access to the full R feature-set. 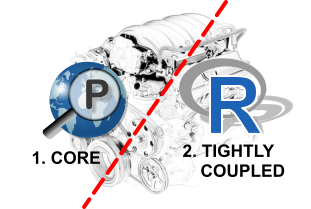 'Automatic' mode hides the complexity of R completely, and simply requires the user to select from one or more built-in R forecasting templates available from Prophecy. It is ideal for the user who just needs to generate sensible forecasts quickly and with minimal statistical knowledge. 'R Expert' mode allows skilled R and statistical users to utilise R's full analytical, graphical and forecasting capabilities. It breaks the process into two steps. First, exporting data from Prophecy into R (RStudio). Second, bringing the forecasts back into Prophecy once they have been generated in R / RStudio. The bit in the middle - generating the forecasts - is done by the user using RStudio and the R language. ‘Automatic’ mode is designed to generate accurate forecasts for non-statistical users quickly, simply and without the need for specialist statistical or R knowledge. The R forecasting models transparently automate parameter selection and generate sensible forecasts with no user-intervention required. The Prophecy user simply selects one or more of the ‘R templates’ provided, specifies which products and customers to apply them to, and clicks ‘Run’. Prophecy then runs R as a background, invisible process to generate the forecasts. The user can then preview the resulting forecasts in a multi-dimensional grid view (similar to a Prophecy report) or with graphs depicting the R forecast versus history and any existing forecast in Prophecy. The final stage in the ‘Automatic’ process is to apply the R forecasts back to the Prophecy database by clicking the 'Apply!' button. In summary, ‘Automatic’ mode requires zero knowledge of R or statistics. Use it to quickly get you as good a set of statistical forecasts as today’s state of the art time series forecasting allows. 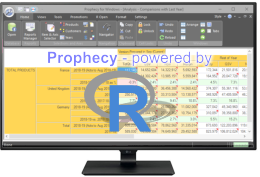 ‘R Expert’ mode lets Prophecy users access the totality of R as a statistical and data science system. 99% of users will use Prophecy’s ‘Automatic’ mode and get great results, because the built-in automatic forecasting routines in R are comparable with the best commercial statistical forecasting engines. However, 'R Expert' mode is also available, to allow those users with statistics and R skills to access the full R feature-set from Prophecy. Use Prophecy's ‘R Expert’ mode to export history from Prophecy into R for analysis, transformation, graphing, presentation and forecasting. Use the RStudio environment for 'to-the-metal- access to R and the sales data. Once you’ve generated forecasts in RStudio, use Prophecy’s ‘R Import’ button to read them back into Prophecy. Returns best ARIMA model according to either AIC, AICc or BIC value. The function conducts a search over possible models within the default order constraints. Exponential smoothing state space model with Box-Cox transformation, ARMA errors, Trend and Seasonal components. As described in De Livera, Hyndman & Snyder (2011). Based on Croston's (1972) method for intermittent demand forecasting, also described in Shenstone and Hyndman (2005). Croston's method involves using simple exponential smoothing (SES) on the non-zero elements of the time series and a separate application of SES to the times between non-zero elements of the time series. Exponential smoothing state space model. Parameters are determined by minimizing the squared prediction error. Prophet is a procedure for forecasting time series data based on an additive model where non-linear trends are fit with yearly, weekly, and daily seasonality, plus holiday effects. It works best with time series that have strong seasonal effects and several seasons of historical data. Prophet is robust to missing data and shifts in the trend, and typically handles outliers well. Prophet is open source software released by Facebook's Core Data Science team. Runs a tournament of methods (Arima, BATS, Croston, ETS, HoltWinters) and chooses the method with the lowest MAPE, as calculated by the accuracy() function of the forecast library.